The Captrate® Solo Filters reduce grease emissions, improve fire safety improve system maintenance, and are innovatively designed, with standard sizes. 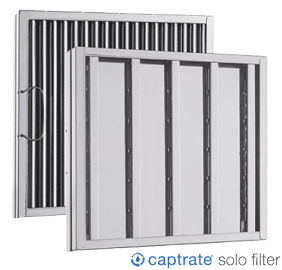 Captrate® Solo Filter is a single-stage filter featuring a unique S-Baffle design in conjunction with a slotted rear baffle design to deliver exeptional filtration efficiency of single-stage devices. Captrate® Combo Filter uses the latest technology in multi-stage grease filtration, delivering unparalleled efficiency for restaurant hood systems. 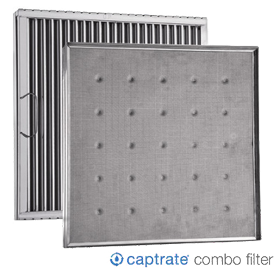 The Captrate® Combo Filter is available for new kitchen hoods and can also be retrofitted into most existing ventilation systems. It will substantially reduce cleaning, maintenance cycles and attendant expenses, providing greater overall cost savings than other grease capture devices or systems on the market today.